My first exposure to sewing was watching my mother. She was of the All Hems Must Be Invisible school, and she hand-sewed blind hems on everything. When I began sewing for myself, I followed her lead… and quickly discovered that I am not a fan of hand-sewing blind hems. No disrespect to the technique is intended; it simply does not work well for me - I'm clumsy with a needle - or the type of clothes I sew. On the long, full skirts common to goth fashion, it takes for-freaking-ever to hand-sew a blind hem. But it takes only seconds to rip one out! Blind hems are loosely sewn and it’s easy to catch your hem on your boot buckle or heel and rip the stitches right out. Abandoning the idea of blind hems, I used my sewing machine to create rolled hems. Not a bad option on cottons, but frustrating on velvet, lace, satin, chiffon… basically all the fabrics loved by goths. Then I bought a serger (overlock machine) and discovered that hemming, even on difficult fabrics, is a task at which sergers excel, and one which they accelerate. They're about twice as fast as a standard sewing machine, so a trip around even a 7-yard hem doesn’t take long. I now rely on my serger for hemming. The photos below show the process I typically use. 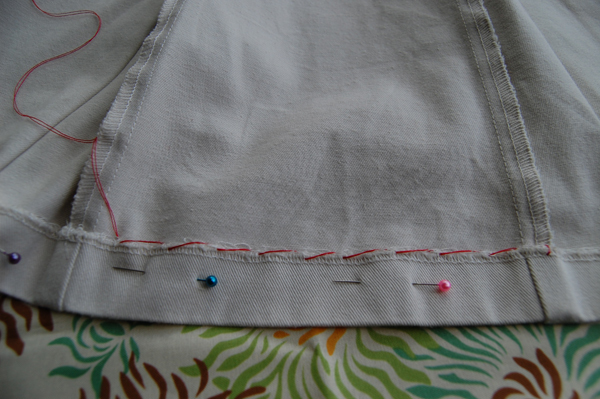 First, set the serger to a narrow stitch and run the fabric through. Unless you want to shorten the garment, position the serger knife so that it just slightly trims the edge. Serge all the way around the hem. You could call it a day at that point, especially if you used a very narrow stitch. I usually add trim using the zipper foot on my regular sewing machine. Depending on the type of trim, you may or may not need to fold up the hem. For ribbon or tape trim, no folding is required. Just stitch the ribbon/tape to the fabric, right side up. This white lace has a pattern almost to the edge, so I stitch it to the right side of the fabric, no folding. With most lace, I fold the fabric. With the fabric right side down, I fold over about 1/4 or 1/2 inch (depending on the size of the lace). I place the lace on top of the fold and stitch. I do this section by section as I’m sewing, no pins needed! From the right side of the fabric, the stitches are visible but not obvious. I am so jealous of your serger! I am a big believer in doing things in a way that works for you, even if it isn't the "right" way (this goes for sewing and real life). My sin is that I keep my pressing to a minimum. I don't press much. I do like to press my patterns before first use, though. Very cool! Thanks for the tip, Bane. My Mom has a serger that she's never used because 1. she can't figure it out, 2. she loves her blind hems and her old style sewing techniques -- techniques that both my sister and I learned. Maybe it's time to give her serger a whirl for my new sewing projects. If your mom's serger is sitting unused, I would say definitely give it a try. There is a learning curve, but, hey, it's fun to learn new things. :) Along with the instruction manual, I read a book on serger basics which was very helpful. Once I got my machine threaded, the hardest part was finding the right speed. Sergers are FAST! Excellent tips and applicatons. I personally cannot keep a hem straight while sewing unless I mark it and go very slow, although I have been sewing for several years now. I have been reticent to buy a serger as they can be pricey. Would you mind telling me what brand is yours? Does the serger eliminate the need to keep a straight sewing line, or do I just need to be more patient and practice? :) Thank you. The serger won't eliminate the need to keep your line straight, but I find that it's much easier to sew a straight hem on a serger than on a regular sewing machine. The serger feeds the fabric through very straight; I think because of the dual feed dogs and the knife. All I have to do is keep the edge of the fabric lined up with the knife as I'm running it through. I gave up on blind hems because they rip out so easily... nice trick, though! I hate hand sewn blind hems too, for the same reason. They take forever, and rip in a second. I learned how to use the blind hem stitch on my machine, and that's so much better. It's fast, a lot more durable than doing it by hand. Though I still do a straight stitch hem most of the time, it's still the easiest.